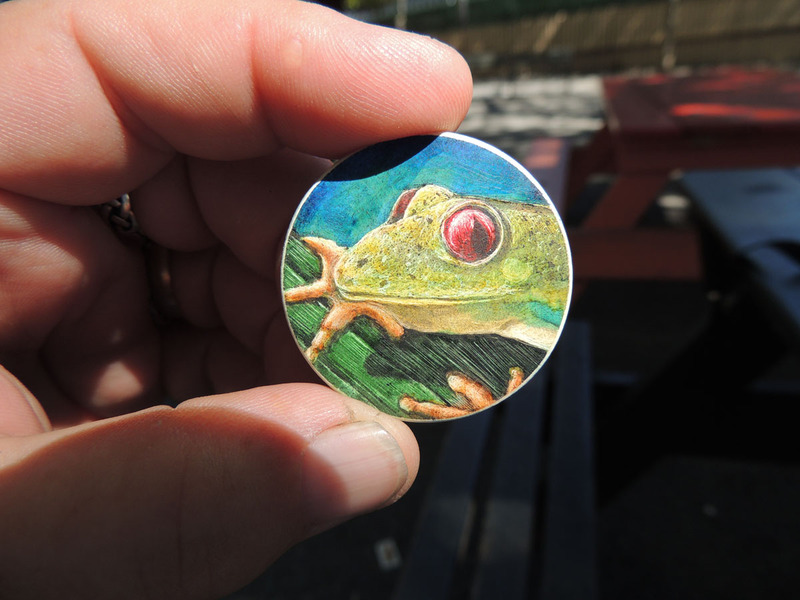 Miniature painting on old clay poker chips of animals, landscapes, flowers, and abstracts combining elements of humanity, humor, and emotion. Pointing to personal empathy involving animals and nature, these chips suggest that animals are looking at the viewers, scenery disappears into far regions, and flowers are stilled. Important elements of clay chips are their scale and surface. Scale has a way of funneling attention inward; bringing the viewer closer, and surface reflects outward the action of line and color. Through this type of medium and the subject matter, it is the intent of the artist to project a story of adoration, play, and examination of each subject’s personal private world. From a technical view, working with old clay chips presents a challenge. As a preexisting medium, chips have different color hues and surface hardness. Using pigmented inks combining drawing and etching dry-point techniques, clay responds to manipulation of its surface, resulting in a kind of color transparency that can be over-layered and under-laid multiple times. Rose McShane was born with a hearing loss, leading the visual world to be her anchor of communication. Graduating from Cooper Union with an emphasis on printmaking, drawing and photography, followed by being a commercial printer for over thirty years, changes in work life created new venues for the artist, such as personal examination, educational advancements, and artistic exploration. Each chip is an original piece. No two chips are the same. Chip inquires can be made to Rose McShane via email.